Powerstep® orthotics are clinically proven to improve foot function, decrease foot pain, increase sense of stability and improve comfort regardless of the nature of the presenting complaint, and it is the #1 prescribed brand among podiatrists. 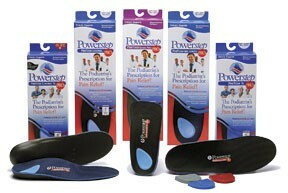 Powerstep offers the highest quality orthoses for preventing and relieving common foot problems. Learn more at www.powerstep.com/proven-effective.